Coordinated for youth by youth, Making Waves seeks to promote healthy relationships while helping participants develop their leadership skills. The program is offered each year in schools throughout New Brunswick and on Prince Edward Island. Each year, our program coordinator gathers a new group of youth to serve as part of the Making Waves leadership group. Comprised of students from all over NB and PEI, members of this leadership group help us develop new program modules and act as facilitators and representatives of their communities at Making Waves conferences that take place in five different regions each school year. 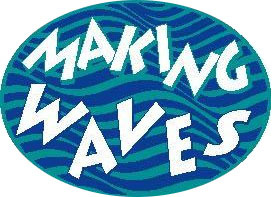 Making Waves was first created in 1995 by a trio of counsellors who worked closely with victims of relationship abuse. In order to expand the program and reach more youth, the program was brought into the Partners For Youth family in 2009. The Making Waves program shifts to different regions each year. In preparing for the coming year, we approach schools within the target region and ask them to identify and gather students who would benefit from the program. Our leadership group for the year is engaged throughout the process and assists us in organizing the yearly Making Waves conferences in each target region. School groups at the conferences develop Making Waves action plans to raise awareness on the issues once they return to their communities.